When news broke in February that an Egyptian firm named Dolphinus Holdings had signed a US$15 billion deal to purchase Israeli natural gas for supply to Egypt, the Egyptian government refused to comment, portraying it as a private market transaction. “The Ministry of Petroleum has no comment on private-sector negotiations or agreements regarding the import or sale of natural gas to Israel,” the ministry spokesperson said in a brief statement at the time. That same day, Reuters quoted an anonymous Egyptian government official who said that the deal did not mean the government itself would import gas from Israel. “International private companies will import gas from abroad in the framework of their own needs,” the official said. Similar claims were made in September after a preliminary agreement was struck for the acquisition of a stake in a pipeline between Ashkelon and Arish that would allow the transport of natural gas from Israel to Egypt. Again, the Petroleum Ministry spokesperson issued a swift response: “The ministry welcomes this new step taken by the private companies involved in the imminent commercial venture.” This time, the Egyptian company involved was called East Gas. But a Mada Masr investigation into the gas import deal — scheduled to come into effect early next year — found that the repeated claims by Egyptian government officials that the venture is a purely private sector affair wholly outside the “government framework” are misleading at best. Documents show that East Gas, which stands to reap the greatest profits from the import and resale of Israeli gas to the Egyptian state, is a private firm that is majority-owned by Egyptian General Intelligence Service (GIS), which will claim 80 percent of the firm’s income. Our investigation found that Shoeib was appointed to the company’s board as a representative of the GIS, and that the chairman of the board has always been the deputy head of the intelligence agency. Most of the company’s board members are drawn from the ranks of intelligence officers. The GIS also partnered with Dolphinus Holdings, the firm that signed the agreement to buy the Israeli gas. Documents and sources reveal that through a complex web of overseas shell corporations and subsidiaries, the intelligence body stands to cash in at all stages of the deal, from the transport of Israeli gas to Egypt to its final sale to the Egyptian government. These profits end up in the coffers of the GIS, and not the public budget. The multiple shell corporations created in recent months form a network spanning the British Virgin Islands, Luxembourg, Switzerland and the Netherlands, but with no presence at all in Egypt. The purpose of these efforts was to close the deal while concealing the identity of the Egyptian players, enabling them to avoid paying taxes, and shielding them from any potential legal liability or public accountability. At the same time, the deal does not appear to be in Egypt’s economic interest, with the cost to Egypt of imported Israeli gas significantly higher than locally produced gas, according to internal corporate documents, and comes at a time when the Egyptian government is reducing fuel subsidies, and dramatically increasing the price of natural gas to Egyptian households. The investigation by Mada Masr into the corporate structure of the deal relied on publicly accessible commercial records in Egypt and European states, available online at no cost or for a nominal fee of $10–$50 for each company. Information contained in these documents was confirmed in interviews with sources who have direct knowledge of various aspects of the deal, all of whom spoke to Mada Masr on condition of anonymity. When Egypt decided to import Israeli gas, it needed a businessman to play the role occupied in the Mubarak era by Hussein Salem, the politically connected businessman who acted as the go-between for the export of Egyptian gas to Israel before the 2011 revolution. That deal created a firestorm of controversy and sparked public outrage. Following Mubarak’s ouster, all officials implicated in the deal were prosecuted on charges of profiteering, bribery and incurring massive losses for Egypt by selling gas to Israel at less than a fair price. This time, Egyptian businessman Alaa Arafa was the chosen go-between. A former doctor, Arafa is the president of Arafa Holdings, which he inherited from his father, General Ahmed Arafa, a former military pilot and a close friend of Mubarak. Alaa Arafa was a logical choice given his long commercial experience with Israel. His firm had an interest in textile ventures in the Qualifying Industrial Zones, areas established in a 2004 deal between Egypt, Israel, and the United States that gave Egyptian producers customs-and-quota-free access to US markets, provided their products included a percentage of Israeli components. Arafa Holdings was also a major domestic player in real estate, agriculture, cement, food industries, and energy. Arafa did not respond to Mada Masr’s multiple attempts to contact him for comment on the findings of this investigation. Arafa already owned a shell corporation outside Egypt, Dolphinus Holdings, which was registered in the British Virgin Islands, a favored destination for those looking to shelter their business earnings from taxes. Documents obtained by Mada Masr show how the pieces were put in place to structure the gas deal. Because Arafa had negligible experience in natural gas, a second person was brought in: Khaled Abu Bakr, chair of the energy committee at the American Chamber of Commerce in Cairo, and the CEO of Taqa Arabia, a subsidiary of Qalaa Holdings. In a text message to Mada Masr, Ahmed Heikal, the chairman of Qalaa, said that his companies were not involved in the deal to purchase gas from Israel “either directly or indirectly.” Three separate sources confirm that Heikal refused to get involved in the deal. Sources say that Abu Bakr came on board the deal in his personal capacity, not as a representative of Taqa Arabia. Abu Bakr declined to respond to questions sent by Mada Masr via text message, saying he was out of the country. To bring in Abu Bakr, Dolphinus created a subsidiary in Luxembourg called Blue Ocean. The firm’s registration filing, obtained by Mada Masr, shows that it is fully owned by Dolphinus Holdings. Three directors signed the company’s financial statement: Arafa, Abu Bakr and Mohamed Talaat Khalifa, a board member and director of investment at Arafa’s company. Why Luxembourg? Most likely because the country is the EU’s biggest tax haven, allowing companies to transfer funds in and out with substantial tax exemptions and a high degree of secrecy. Most importantly, Luxembourg has a double taxation treaty with Israel, meaning that Arafa and Abu Bakr would pay as little as one percent of earnings in taxes while not paying any taxes in Israel. In order to allow the private sector to import and sell natural gas in Egypt, the Egyptian natural gas sector had to be fully liberalized. A government-drafted bill for the liberalization of the gas trade was approved by Parliament with no significant revisions in July 2017. A month later, the law was ratified by President Abdel Fattah al-Sisi. The law reduced the state’s role to that of a regulator. It also granted private firms the right to use the national gas distribution grid and all state-owned infrastructure facilities in the sector. This set the stage for Dolphinus to buy gas from Israel and resell it to Egypt. The implementing regulations of the law were issued in February 2018, and a week later Dolphinus signed an agreement for the purchase of gas with Delek Drilling, an Israeli firm, and Noble Energy, a US firm based in Texas. Combined, these firms hold the concession for two Israeli gas fields, Leviathan and Tamar. Unlike Mubarak’s dealings with Hussein Salem, the current regime did not leave the deal solely in the hands of Arafa and Abu Bakr. The businessmen could not be allowed to make a fortune off the arrangement like Salem had. Whereas he was a former intelligence officer, Arafa and Abu Bakr are civilians rooted in the business world, which is little trusted by the regime. Enter Shoeib, the former president of the Egyptian Natural Gas Holding Company (EGAS) and the current CEO of East Gas, which is 80 percent owned by the GIS. The Egyptian General Petroleum Corporation (EGPC) and EGAS also each own a small share in the company. Mada Masr reached out to Shoeib for comment, but he declined, saying he was out of the country. The spokesperson for the Ministry of Petroleum, Hamdi Abdel Aziz, asked that written questions be sent to him via WhatsApp. As of publication, we had received no comment from him. In May 2018, three months after the agreement was signed for the purchase of Israeli gas, East Gas (owned by the GIS) partnered with Blue Ocean (owned by Arafa and Abu Bakr) to form a new firm: Energy Solutions. This time, the company was headquartered in Switzerland. While Luxembourg offers favorable tax exemptions on capital gains, the new company also needed exemptions for corporate taxes, such as the purchase and sale of gas, and there is no better place than Switzerland, particularly the Zug canton where Energy Solutions was registered. Known worldwide for its “attractive” tax climate, Zug even touts this status on its website. Like Luxembourg, Switzerland maintains a double taxation treaty with Egypt (1987) and Israel (2003). The commercial register for Energy Solutions, dated May 17, shows that East Gas owns a 40 percent stake while Blue Ocean holds the remaining 60 percent. The firm’s capital is no more than $20,000. The board of directors, according to the registry, includes Shoeib (the president of East Gas), Abu Bakr and Arafa with their deputy Khalifa, and an Egyptian businessman by the name of Ahmed Samir Abdel Fattah Ghars Eddin. It is not definitive whether East Gas will, through this Swiss partnership, share in the profits that Dolphinus stands to make from the $15 billion deal it signed in February. Yet the fact that Energy Solutions was established as the gas deal unfolded, is comprised of the same set of Egyptian partners and was formed under a legal structure that offers hefty corporate tax exemptions, make it a likely prospect. After the agreement was signed, one hurdle remained before Israeli gas could flow into Egypt: Israel possesses no infrastructure for the liquefaction or transport of gas to Egypt. Building an underwater pipeline between the two countries would be prohibitively expensive and time consuming. This is why Israel was so eager to sign a deal with Cairo: it has a lot of gas and no outlet for it. This was the driver behind the acquisition of a pipeline owned by the East Mediterranean Gas Company (EMG) — a consortium of Israeli, US, Thai and Egyptian firms registered in Egypt. The pipeline, which runs from Ashkelon, Israel to Arish, Egypt, was used to pipe gas from Egypt to Israel under the Mubarak-era deal brokered by Hussein Salem. With a technical modification, it can be adapted to pump gas in the opposite direction. Who profits off the pipeline? This may have been the original plan, but it changed significantly. Officials in Cairo realized that if the acquisition went through, Egypt would retain only a 10 percent stake in EMG, held by the EGPC. 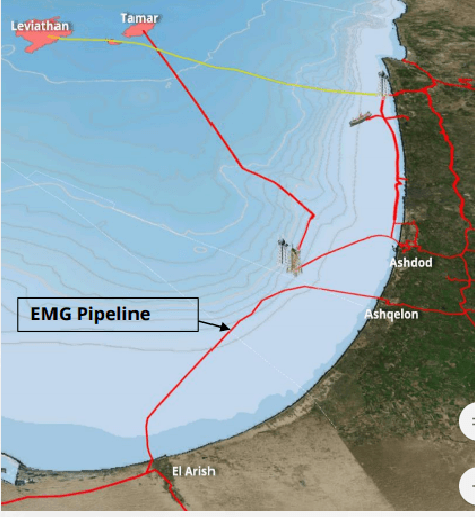 Plus, EMG would earn fees if its pipeline were used to move gas from Ashkelon to Arish. So why shouldn’t the GIS, through East Gas, acquire a stake in the pipeline and take a cut of the usage fees? When East Gas joined Delek and Noble Energy in negotiations to acquire EMG, East Gas created a new firm called Sphinx and registered it outside Egypt, in the Netherlands, perhaps because authorities in Cairo thought it unseemly for an Egyptian government intelligence agency to enter into a direct partnership with an Israeli company. The Netherlands is also the world’s biggest conduit to offshore corporate tax havens, and it too has double taxation treaties with Israel (1973) and Egypt (1999). 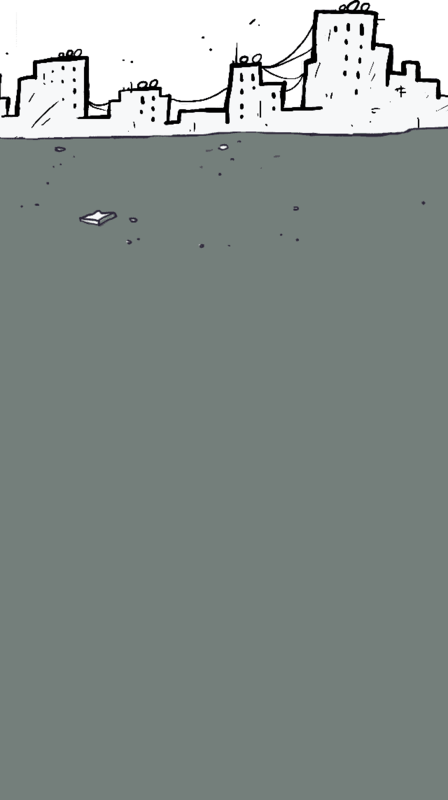 The Dutch commercial register for Sphinx shows the firm was registered less than two months ago, on August 31, 2018. The only company official listed is Shoeib, the president of East Gas, which owns 100 percent of Sphinx’s shares. The company’s capital is listed as just $1,000. A few days after it was created, Sphinx (owned by East Gas, in turn owned by the GIS) formed a new company, EMED, also in the Netherlands, with Delek and Noble Energy. Sphinx owns 50 percent of EMED, according to the disclosure form Delek sent to the Israel Securities Authority. In late September, EMED announced it had purchased a 37 percent stake in EMG from businessmen Yossi Maiman and Sam Zell and a 2 percent stake from Ali Evsen, the Turkish businessman who once, and perhaps still, acts as a front for Salem. East Gas also acquired a separate 9 percent stake from Evsen, in exchange for which all of Egypt’s arbitration claims against him, filed after the January 2011 revolution, were dropped. It was Shoeib who made the decision to suspend gas supplies to Israel in 2012, when he was the chair of EGAS. EMG considered the decision a breach of contract, and as a result it filed three separate arbitration suits against Egypt: the first before the International Chamber of Commerce, seeking $1.6 billion in damages; the second before the International Center for Settlement of Investment Disputes (ICSID), for more than $800 million in damages; and the third, seeking roughly $757 million, before the tribunal created under the UN Commission on International Trade Law. With the newly acquired shares in EMG in addition to the 10 percent stake owned by EGPC, Egypt now had enough voting power on the EMG board to drop all arbitration suits filed against Egypt. In fact, this was a non-negotiable condition for helping Israel find an outlet for its gas, one demanded repeatedly by Egyptian officials: imports in exchange for eliminating arbitration fines. The pipeline agreement additionally gives Delek and Noble Energy the rights to use another pipeline between Aqaba, Jordan and Arish, Egypt to supply any additional quantities of Israeli gas in the future. According to the agreement and official Egyptian sources, the sole owner of the Aqaba-Arish pipeline is East Gas. In the final tally, East Gas — that is, the Egyptian intelligence agency — is part owner of the pipeline to Israel, a partner with Dolphinus which will buy the Israeli gas, and the sole owner of the pipeline to Jordan, which can be used to pump Israeli gas to Egypt if the Israeli line comes under attack in Sinai — as it has numerous times in the past — or some technical flaw is discovered. And that is not all. 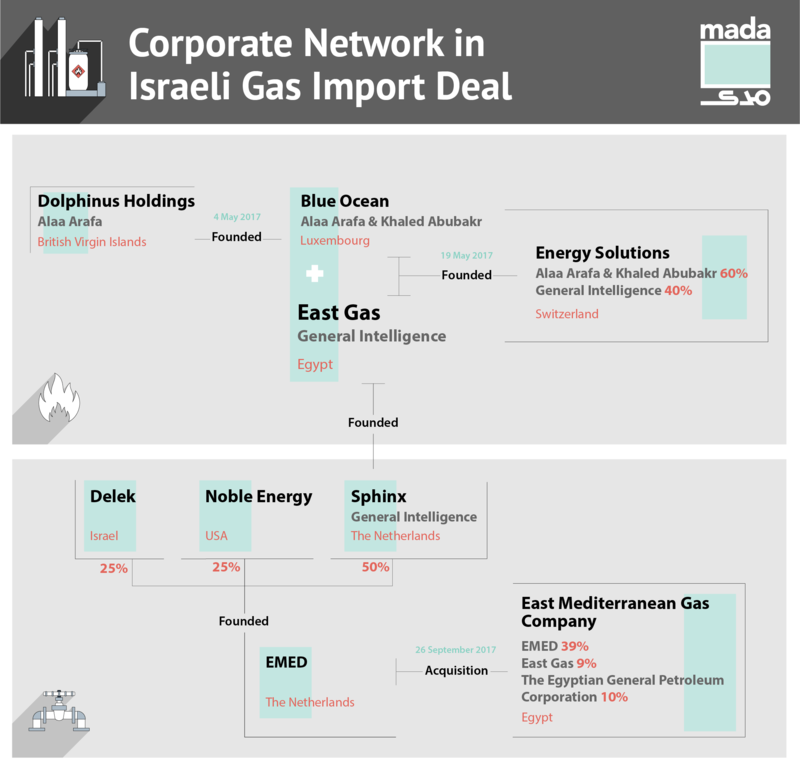 Sources with knowledge of the deal tell Mada Masr that the plan now is for Dolphinus (or its front, Blue Ocean) to buy gas from Noble and Delek then sell it in Ashkelon to East Gas, which will pump the gas to Arish through the EMG pipeline, where it will be sold to the Egyptian state, represented by EGAS, which will in turn use the gas in Egypt or export it. In other words, East Gas will claim transport fees on the gas pumped from Israel through the pipeline it partly owns and turn an additional profit when it resells the gas to the Egyptian government. It will also get a cut of any deal to move additional Israeli gas from Jordan to Egypt and then resell that to the Egyptian government at a profit, along with the transport fees for moving the gas through the Aqaba-Arish pipeline it owns. With profits flowing in at every point on the supply chain, GIS-owned East Gas and a handful of businessmen will avoid all taxes by having registered its commercial activities in tax havens outside Egypt. The company and its partners will also be fully insulated from accountability or Egyptian legal sanctions in the event of any unanticipated political developments. As with other commercial ventures it operates, the Egyptian General Intelligence Service does not treat its ownership of East Gas as a closely guarded secret. Nevertheless, the agency does not typically declare its ownership, the names of shareholders, or the names of those running its companies. With the exception of a handful of interviews with East Gas CEO Shoeib over the last two weeks, there is little information available about the company — located on al-Nabawi al-Mohandes Street in the Sifarat area of Nasr City — or other company officials. Nevertheless, it is common knowledge that the company is a subsidiary of General Intelligence among people working in the gas trade and transport in both the public and private sectors. Mada Masr obtained an official copy of East Gas’s commercial license (no. 67352), which notes the company’s activity, the names of members of its board, and all changes to the board since the firm was registered in 2013. The chairman of the board of East Gas when it was registered was Lieutenant General Abdel Wahab Sayyed Ahmed, who was appointed the deputy director of the GIS while Omar Suleiman headed the agency. In 2016, he was replaced by Major General Tarek Sallam, GIS deputy director under Khaled Fawzy. After Sallam left the agency last year and was made Egypt’s ambassador to Uganda (as Mada Masr reported in an exclusive in August 2017), the current chairman took his place: Major General Ibrahim Abdel Salam. Abdel Salam was touted in the press as the potential chief of intelligence when Fawzy was removed in January, before Abbas Kamel, formerly the president’s chief of staff, assumed the position. According to the commercial registry issued on October 3, Abdel Salam was still the chairman of the board when it last met in August. Along with leadership positions on the board, the commercial registry shows that most East Gas board members are drawn from the ranks of intelligence officers, meaning that most shares in the company also belong to the agency. They are appointed to the board as representatives of the Egyptian Company for Investment Projects, widely known in the business world as the commercial arm of the intelligence agency. A search through publicly available sources turns up no information on the Egyptian Company for Investment Projects, with the exception of an address on Abdel Megid al-Ramalli Street in Bab al-Louq. But the Orbis Directory, owned by Moody’s and accessible for a fee, indicates that the company was registered in 1958. In July 2013, it was headed by Lieutenant General Abdel Wahab Sayyed, then the GIS deputy director and also the chair of East Gas. According to Orbis, the company’s shares were owned evenly by just two people: Ahmed Ibrahim al-Awady and Mohammed Ahmed al-Guindy. A search for the two owners found that they were both commanders in the October 1973 war and both the recipient of state honors. Member of General Staff Major General Ahmed Ibrahim al-Awady is a former paratrooper commander and a current MP for the Homeland Defenders Party for Sanbalawein district in Daqahlia; he is a member of the House’s Defense and National Security Committee. Major General Mohammed Ahmed Kamal al-Guindy was a pilot in the air force, a recipient of the Military Star, Medal of Duty and Medal of Courage. MP Awady did not respond to Mada Masr’s calls and messages asking for comment on his relationship to the company. Guindi could not be reached for comment. The commercial registry indicates that East Gas started operating in 2006, although it was only registered as an investment company in 2013. Two important facts are known about the firm: first, that the company is a subsidiary of Egyptian General Intelligence and second, that profits from the trade in gas go into the coffers of the company and the intelligence agency, not the public budget. These facts are established in the case files for the trial of six Mubarak-era officials in the petroleum sector in connection with corruption in the export of gas to Israel (Case 41/2011). According to the transcript of the interrogation of defendant Ibrahim Tawila, the former chair of EGPC, Tawila told the public prosecution that East Gas was “the transporting, intermediary company” for Egyptian gas to Jordan before the 2011 revolution. “It received half the value of the contract from Jordan,” he said, an estimated $1.8 billion. Tawila said East Gas was an Egyptian company, “80 percent of its shares owned by Egyptian National Security and 20 percent by the petroleum sector.” The Cairo Criminal Court acquitted all six defendants in the case in 2015. In fact, this is no secret. Did Egypt really “score a goal”? In February, two days after the announcement that Egypt would import natural gas from Israel, President Sisi addressed the deal in an impromptu speech broadcast on television while inaugurating an investors’ service center. During the speech, he answered a question no one had yet asked publicly: Why import gas from Israel given the talk about the huge production from Egypt’s Zohr gas field in the Mediterranean. “I found people were — I mean, they were confused,” President Sisi said. “How are you talking about the Zohr field and how it will achieve self-sufficiency for us, and at the same time, you’re going to get gas from somewhere else [i.e., Israel]? If we’re going to get it from somewhere else, we’ll get it through market-based mechanisms. Lord, please get this straight. I mean, how much will we pay for it? Right? How much will we pay? Do you know how we buy our needs? Do you? [Laughs] No, we, thanks to God Almighty — I’m not just talking, I want this to get through to you. No, we scored a goal. Egyptians, we scored a big goal here. Am I right?” Attendees in the hall broke out in applause. Leaving aside repeated references to “market-based mechanisms” and “the private sector,” Sisi perhaps thought at the time that Egypt had procured Israeli gas with “savvy” and thanks to the skills of the Egyptian negotiators in the private sector. Maybe this was what he was told by the bodies that did the negotiating. But the negotiators who signed the deal with their Israeli partners certainly know better. CI Capital is one of the three biggest investment banks operating in Egypt, along with EFG Hermes and Belton. The bank is also owned by Alaa Arafa, acquired by him and other partners in 2016 in a deal valued at LE683. The report concludes that the cost means that the gas will be sold to the end user for “$7.50-8/mmBtu, on our calculations.” For comparison’s sake, the report refers to the cost of producing local gas in Egypt, which ranges from $1.75 to $3.50 per btu after dividing costs with foreign firms, and the sale price in Europe, $5.80 per btu. 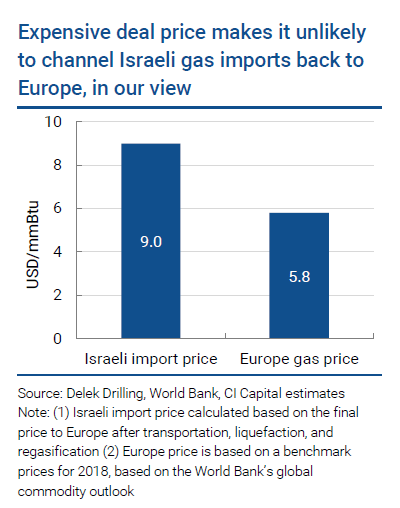 In light of this cost, the report concludes that it is unlikely that Israeli gas can be exported to Europe, demonstrating in graph form the difference between the price Egypt is paying to import Israeli gas and the sale price of gas in Europe. 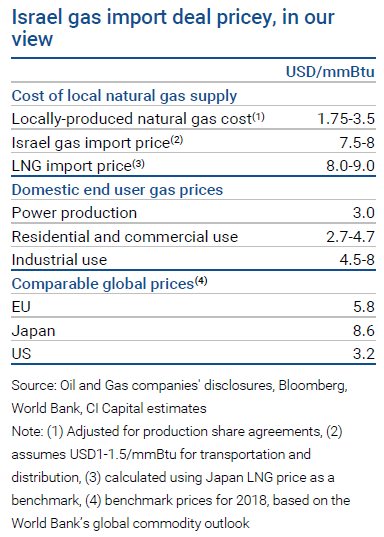 The following table, also included in the report, further shows the difference in price between locally produced gas and Israeli imports, and gas prices in the EU, US, and Japan. The reluctance may be because the report shows that the bank’s client, Shoeib, who, according to sources, travelled to Israel personally to negotiate the deal, knew that the deal was not in Egypt’s economic interest, at least according to the report. It may also be because the report’s contents could interfere with the Egyptian government’s intention to declare Egypt self-sufficient in liquefied natural gas. (The declaration was released on September 29.) The CI Capital report estimates that self-sufficiency will last no more than a year or two before Egypt will be compelled to restart imports. The same thing already happened in 2004, when Egypt declared itself self-sufficient before soon resuming gas imports. 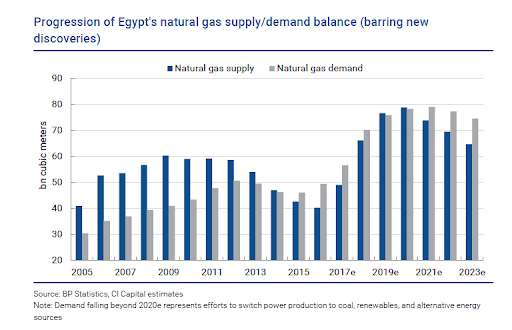 The report estimates that local gas supplies, including the production of the Zohr field, “despite its sheer volume, will be fully absorbed” by to the need to replace Egypt’s substantial LNG imports, growing local demand for gas, and the need to replace the mazote that currently runs power plants with adverse economic and technical impacts, as well as the inevitable decline in production in gas fields other than Zohr. The report includes a graph that demonstrates the disparity between gas supply and demand in the coming years. In the summer of 2018, the government raised the price of household natural gas by roughly 50 percent. The CI Capital report expects (and recommends) continued cuts to government gas subsidies, anticipating that, by the time the sector is fully liberalized, the price for citizens will increase an estimated 127 percent on current prices. Egypt hopes to import gas from Israel and Cyprus, then treat and liquify it for export to Europe. Export dreams: Will Zohr gas production allow Egypt to light Europe and its own cities? Waad Ahmed | Can the narratives of self sufficiency and dreams of export Egypt's pinned on Zohr be reconciled?